A decade after its artistic and commercial renaissance, the ?Lobster Capital of the World? is experiencing growing pains. At age forty-five, I wanted to climb Mount Katahdin to prove to my older brothers I was no longer their baby sister. Guess what happened? ?Tomato Lady? Amy LeBlanc, of Wilton, grows more than 300 varieties of organic tomatoes. She holds her plants to a high standard ? and her customers to an even higher one. Do you have what it takes to pass her test? Centrists are flexing their muscles in the U.S. Senate. But stopping the closing of military bases in Maine ? and the loss of 7,000 jobs ? might be the ultimate test of Senator Susan Collins? political clout. What kind of person risks life and limb, taking off from grassy airstrips and skimming treetops, all for a ?hundred-dollar hamburger?? Abby Zimet meets the barnstormers. Wabanakis called this gorge ?place of the perpetual rainbow.? Have you ever rafted through this ravine? At Sarah Jeanne?s Family Hair Care in Lewiston, the pursuit of beauty takes many wild and wonderful forms, as photographer Melonie Bennett discovered. The new Abbe Museum in Bar Harbor does more than preserve the past of Maine?s Wabanaki Indians ? it celebrates their present. Looking to recapture the psychedelic mood of the 1960s and ?70s? Here?s the trippy road trip for you. Yes, you can afford great Maine art on a less-than-great budget. Just ask the Gleasons. 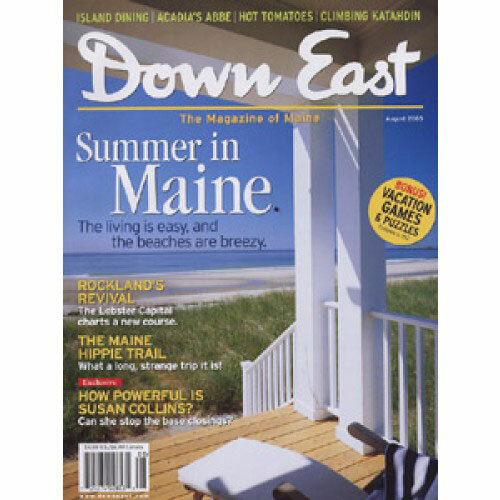 A new house on the dunes of Biddeford Pool captures the bright and breezy style of summer in Maine. Maine towns want tourists, so why won?t they provide the restrooms they need? Like the best of Hitchcock, Monica Wood?s new novel is an intimate shocker. The makers of Morse?s sauerkraut have opened a market and caf? for schnitzel fans in Waldoboro. Maine should fight hard to keep its military bases but also plan for life without them. How a meatball surgeon, back from Korea, helped me out of a jam in Waterville. The restaurant in this grand summer hotel is well worth the voyage. Fairs, festivals, plays, and concerts pack Maine?s summer schedule.